PyLoad is a free self hosted download manager. You can use it to download files from internet using their links and save them on the disk. This is an ideal download manager for remote servers which can easily be installed. Or, if you want to use it locally then you can do that too. It can download a single or multiple files easily using the links. And there is a remote control feature as well. You will not have to log in your server again and again to run it. It can be managed right from a simple web-based UI to download and save files. You may have used a lot of download manager software but this one is different. It is lightweight and open source download manager that you can use to download files. You can run it on multiple platforms and you just have to configure it once and then easily use it anytime. It lets you remotely download files to your server’s disk. You can log in to the main web UI of this download manager from anywhere and then download whatever you want. If you have knowledge of using Python then you can install this from source on your server or local machine. You can easily install it in a few steps and then use it from your browser. The web interface is very simple to operate and download single or multiple files. Install this download manager on whatever OS you are using. But for this post I will be demonstrating the process for Windows. Follow these steps to see how to download and install it. Step 1: Grab the PyLoad executables for Windows from here. After that, extract them and then run the setup file. It will first ask you to configure it. A command window will popup and will ask you to answer some questions. You have to type your preferences like language, download directory, enabling remote access, etc. Step 2: After you have configured it, you can open it. 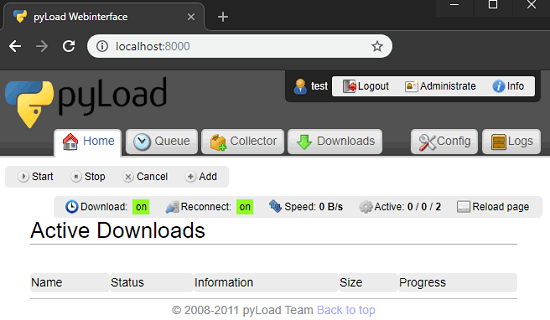 The web interface to manage the downloads is at “localhost:8000”. Or, if you chose a different port during installation, then point your browser there. 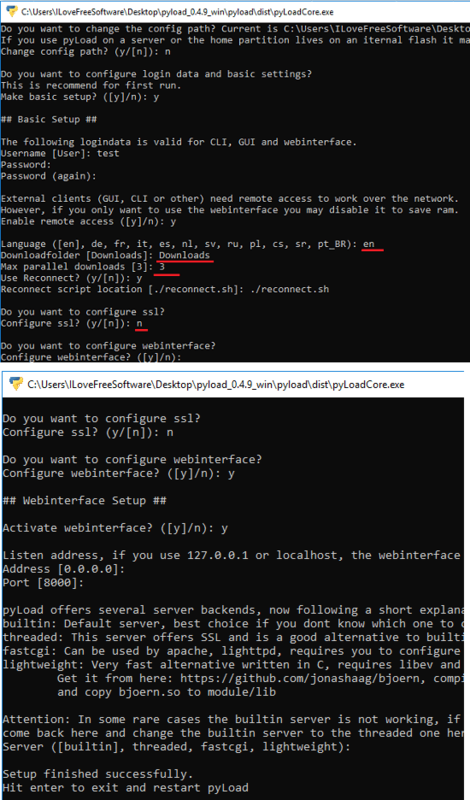 Step 3: If you opt for remote access during installations then it will ask you to set a username and password. It will prompt for that when you open its web interface. So, just log in using your credentials and start using it. Step 4: To create a downloading task, click on the “Add” button. Specify the link and name for your download task. Here you can also opt to pack the downloaded file in an archive, protected with a password (optional). Step 5: After downloading, it will save the downloaded files in the configured folder. Or, you can see the downloaded files from the web UI as well. With the help of these steps, you will be able to download, install, and run this self hosted download manager. You can easily get it running and then download anything that you want with it. Also, if you want to use it locally for downloading files then you can do that in the same way. There are some really powerful download managers for downloading files. But if you want one for your servers with remote control feature then PyLoad is a very good option. You can access and manage it using the browser and from anywhere easily to save files to your server from internet.